As you will see on the “Our Story” page of our website, I’ve developed a gluten sensitivity that is pretty strong so I eat entirely gluten and wheat free. This is the next installment in what will be a long series of my experiences eating gluten free around all of Disney World. Here in our Le Cellier Gluten Free review, I’ll cover the food but other topics related to the restaurant as well. This will include my experience, service, options and anything else I think others trying to eat gluten free may care about. I love Epcot and all the food options it has to offer. However, all the options make narrowing down a final choice very difficult! Mike and I have been talking about trying Le Cellier for years, so we finally booked an ADR for ourselves and Anna and Elsa. 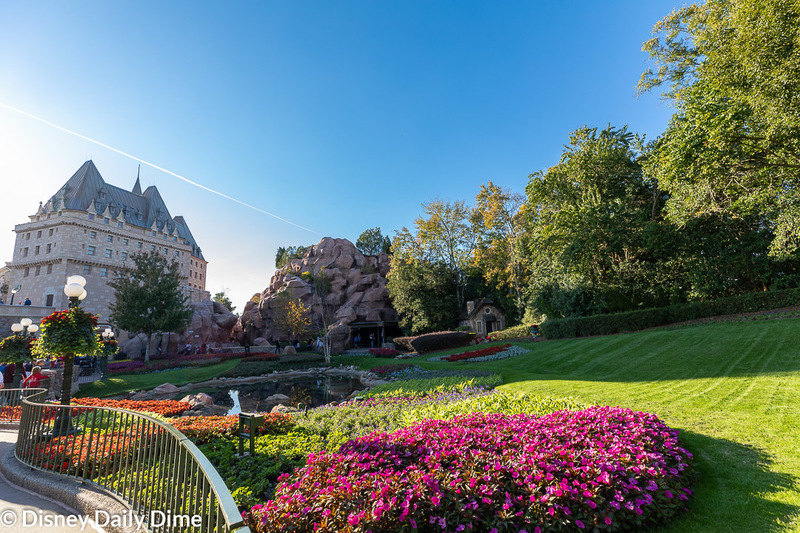 Le Cellier is a signature dining experience located in Epcot’s Canada pavilion. The restaurant is meant to invoke a wine cellar vibe. It is certainly on the smaller side compared to other Epcot restaurants. Low ceilings and low lighting enhanced with candles and sconces creates a setting that feels a long way from the Florida sunshine. The only downside is the tables are located very close to one another. So close that I truly felt the table next to us could hear our conversation when they weren’t talking. Aside from the close tables, we loved the atmosphere. The stone walls, arches and low lighting are an inviting steakhouse atmosphere and certainly represent “the cellar” as it is named. The fireplace and art work were nice touches that make it feel a little more Canadian. Lunch or dinner both require two credits on the Disney Dining Plan. Even though it is a signature restaurant, it does not adhere to the signature restaurant dress code like the resort restaurants due to its location in the theme park. The allergy menu was well organized, listing all the menu items and what was safe for each kind of allergy. You can see the menu below. 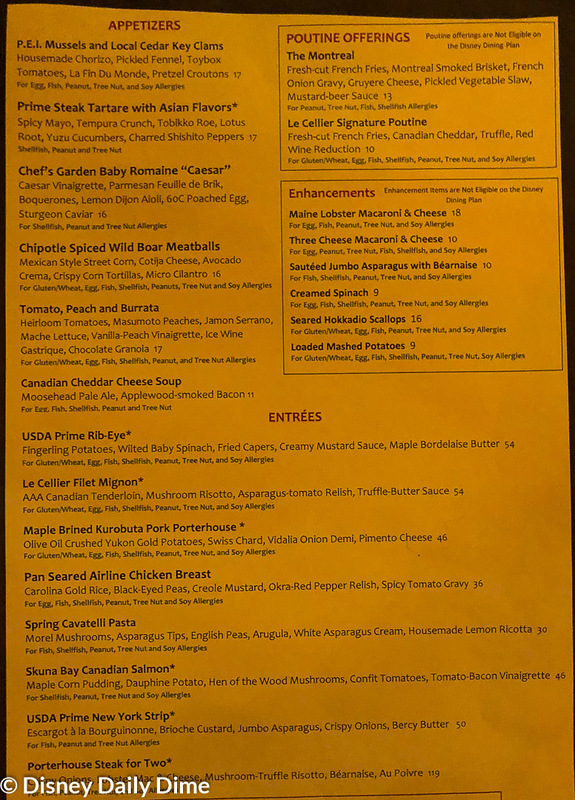 While there weren’t a ton of options for appetizers and enhancements that were gluten friendly, I was pleased that there were a few entrée options. I didn’t inquire whether some of the other meals listed could be modified to be gluten friendly, as I was pleased with the options available. Our server Candice was extremely attentive to my needs and she was excited to tell me that the maple crème brulee was gluten friendly! 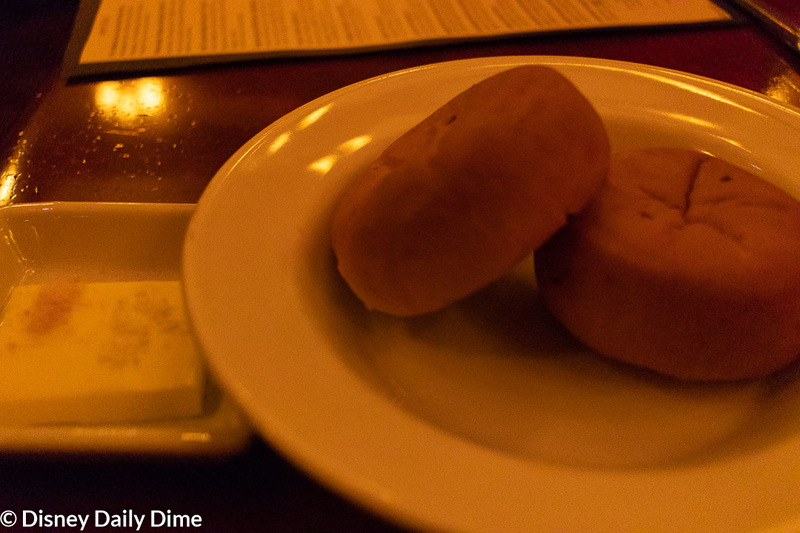 As with every table service meal, I was given the same type of gluten free rolls you find throughout Disney World. They were served warm with my own butter. 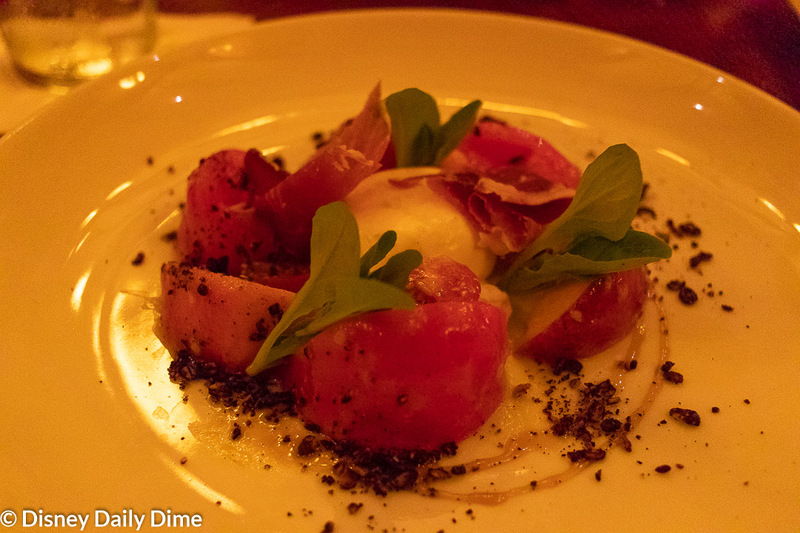 For my appetizer, I chose the Tomato, Peach and Burrata Salad. As a fan of caprese salads, I was intrigued by this tomato-based salad that offered peaches which is not something I would typically put together. The salad also included jamon serrano, mache lettuce, vanilla-peach vinaigrette, ice wine gastrique and chocolate granola. This interesting combination of flavors worked amazingly well together. This was a delight and certainly not something you would find just anywhere. 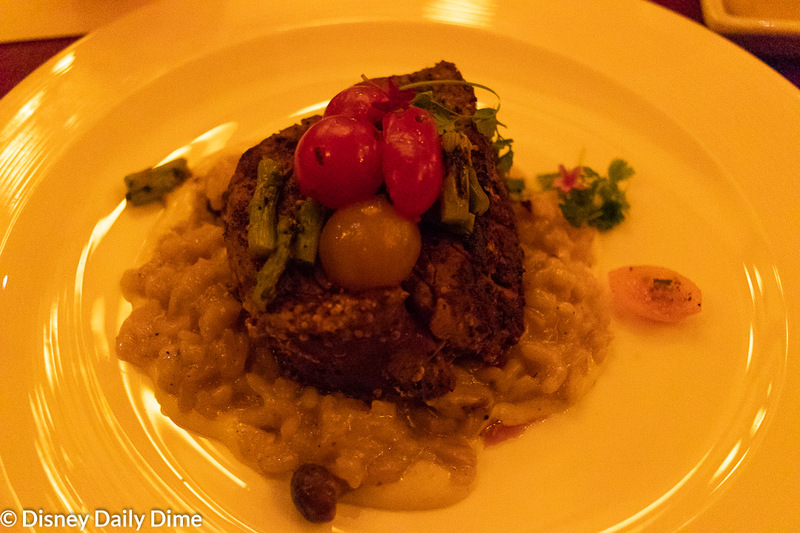 I was thrilled that Le Cellier’s signature Filet with Mushroom Risotto was gluten free since this dish is so popular. I love risotto and was eager to try theirs based on such high praise and the word of mouth I have seen online. The filet was delicious. It was clearly a high-quality cut of beef and cooked perfectly. The mushroom risotto was creamy, rich and bursting with flavor. Presentation of the dish was beautiful as the risotto was the bottom layer with the filet lying on top. The filet was topped with asparagus and tomato, which balanced the rich flavors of the steak and risotto and provided texture. Even though we were stuffed, our amazing server Candice convinced us that we couldn’t leave without trying the Maple Crème Brulee. She even offered to box it up for us to take, but Mike and I both decided to go for it right then. I have been fortunate to try many flavors of crème brulee outside of the standard vanilla bean so I was excited to try a new flavor. Oh my. This crème brulee was outstanding! Sweet, rich and creamy, the maple flavor was blended perfectly into the custard. It was the perfect ending to such a fabulous meal. Note that the picture above is Mike’s creme brulee and not mine. Mine was served without the maple leaf cookie in order to be gluten free. 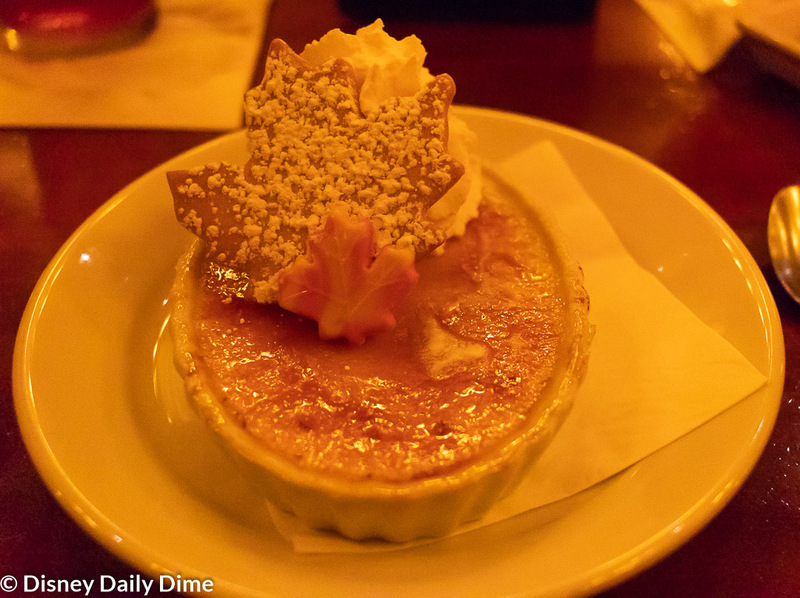 As we discussed in our main Le Cellier review, I thoroughly enjoyed every course of this meal. The salad was a unique and refreshing appetizer, the filet and risotto were delicious and the maple crème brulee was the perfect sweet ending to the meal. This is a great place to have a “special occasion” meal without having to leave Epcot and go to one of the signature restaurants at a resort. Our only caveat is that this is still very similar to many fine steakhouses and not necessarily worth the “premium pricing” of its location inside of Walt Disney World. If you are looking for a signature steakhouse atmosphere while in the World though, this is a worthy choice. If there’s more information on gluten free dining you would find helpful in these reviews, feel free to drop down in the comments and tell us. Alternatively, you can email us from the contact us page. 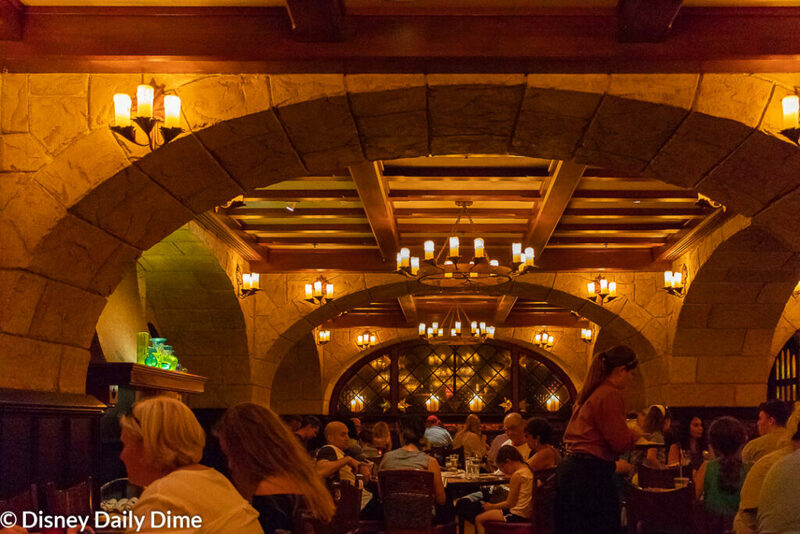 We hope you found our Le Cellier gluten free review helpful. If you did, please share it with others you think may find it useful. Just hit the social media sharing buttons on the page! We always appreciate it when our readers share our content with others, as it allows us to help more people and spreads the word about our blog. Join our mailing list to receive the latest Disney news and travel planning tips! Thanks for subscribing! We'll be in touch soon with the latest news on Disney!